For Exchange 2000 and Exchange 2003 prior Service Pack 1, the building of an URL suitable for WebDAV requests against a users mailbox is a rather complicated thing. A solution for this is descrbied under the section Solution. If you only have a domain\username, not the distinguished name of the user, you must first get the latter one. See this aricle how to retrieve the name. From that object, retrieve the property homemdb. This property contains the distinguished name of the mailbox store. Retrieve the directory entry of the mailbox store. From this object, retrieve the property named msExchOwningServer. This is the distinguished name of the Exchange server that hosts the mailbox. Get the root of the http virtual server on the exchange server. The distinguished name is CN=http, CN=Protocols, <distinguished name of the exchange server>. Search for all http virtual server (LDAP filter: (objectClass=protocolCfgHttpServer), Scope: OneLevel, retrieve these properties: msExchServerBindings, msExchDefaultDomain). From this list, retrieve the default SMTP server. It's the one without the attribute msExchDefaultDomain. Open the node CN=Default Policy, CN=Recipient Policies, CN=<Name of your organization>, CN=Microsoft Exchange, CN=Services,<Distinguished name of the configuration naming context>. Retrieve the property gatewayProxy. This is a multi-valued property that contains the default addresses of the organization. Check each of the entries in that list. If it starts with SMTP:, you have found it. If the protocol identifier is all uppercase, it is the default entry for that protocol. Iterate through the list of assigned addresses and search for the SMTP address which domain part matches with the default SMTP retrieved above. Extract the alias and the domain from the address. Iterate through the list of virtual HTTP server and check the property msExchDefaultDomain of each entry. If it matches the domain of the users address domain, you have found the correct http server. From the node of the exchange server, retrieve the property networkaddress. Iterate through this property and retrieve the value which starts with ncacn_ip_tcp:. Now, build the url with the above scheme, using the just found ip address. When examined via WebDAV, distribution lists are stored as items of type urn :content -classes:group. 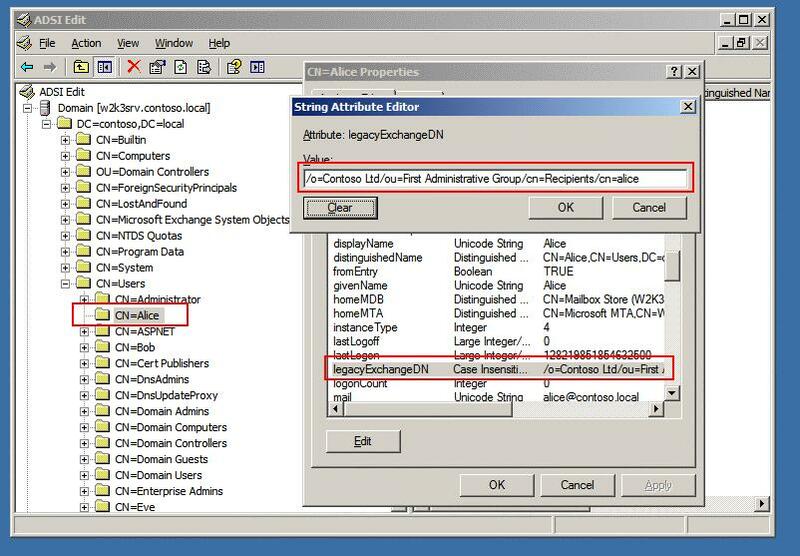 The Outlook message class (http://schemas.microsoft.com/exchange/outlookmessageclass) is IPM.DistList. The information about the members of the distribution list is stored in the field http://schemas.microsoft.com/mapi/dlmembers. This is a multivalued field of type mv.base64. Unfortunately, this field is not documented by Microsoft. But, as pointed out in the summary, user can manage their distribution lists via Outlook Web Access. So, one way to programatically manage distribution lists is to simulate an Outlook Web Access client. This method is used in this article. To get the contents of a distribution list, make a GET request to the URL of the distribution list with the query-string set to Cmd=viewmembers. The User-Agent header must be set to Mozilla/4.0 (compatible; MSIE 6.0; Windows NT 5.2; .NET CLR 1.1.4322) so that the Exchange ISAPI filter knows the client can handle an xml response. The member is is espacially important when removing members from a distribution list, because it must be passed along with the request. Again, the User-Agent field must be set to the value mentioned above. On success, you will receive a HTTP/1.1 302 Moved Temporarily message that point to the url of the list with the querystring set to Cmd = viewmembers. Be sure to set the member id to the id of the entry you want to remove. When successful, you will receive the same response as above. This article was formerly published under the title "Get Free/Busy data for an Exchange 2000/2003 user via HTTP requests". For each user, Exchange stores a free/busy data on the server. Exchange 2000 and 2003 store the free/busy information in a public folder. Exchange 2007 can also do this for compatibility, but it offers a far more convenient way to get the availability, namely a WebService. With Exchange 2000/2003 we are left with two options to read the availability data: Use OWA and pretend to be an Internet Explorer 6 or later, or access the free/busy data directly. I will cover each option in this arcticle. The availability information is stored in the NON_IPM_SUBTREE folder hierarchy below the Public Folders hierarchy in a folder called EX:/o=<Name of your organization>. For each administrative group, there is a subfolder. Each one of those folders contains the availability data for the users associated with that administrative group. The question is: How do I get the right item in those folder for a particular user? The answer comes in the form of the legacyExchangeDistinguishedName property from the Active Directory object of the user. Since the legacyExchangeDistinguishedName contains a slash in the item name, you must encode it with is unicode representation, _xF8FF_, otherwise Exchange would treat it as a folder delimiter. All these properties live in the http://schemas.microsoft.com/mapi/proptag/ namespace. We'll start with the last two properties. These contain the start date and the end date of the published data. These values always fall on month boundaries and are encoded in systime, a MAPI datatype. 2 /// Parses a MAPI systime and converts it to a <see cref="DateTime"/> instance. The method requires you to extract the arrays from the xml response stream and decode the base64 encoded data to a byte array. The FreeBusyStatus type in line one is an enumeration consiting of the various free/busy status. The method iterates through the two arrays. From each entry in the monthValues array, it extracts the start date for that range. It then constructs a BinaryReader to read through the corresponding entry in the eventEntries array and extracts the event information from the stream. For each entry, the StoreFreeBusyEntry() is called to do something with the extracted information. In my library, I put them into a global list of events. You'll have to call this method for each of the three pairs of properties. Note that not all properties are always set. If no appointment with a free/busy status of busy occurs during the published period, the two corresponding properties would be null. This method will work with Exchange 2000 and 2003. It will also work with Exchange 2007 if you have the public folder tree installed, which is not longer mandatory. When you create a meeting with OWA, it will display the availability information of the attendees like Outlook does. To get the information, it uses a special OWA command which returns the free/busy information as an XML stream. The <startDate> and <endDate> must be replaced with the date range you are requesting, in the format yyyy-MM-ddTHH :mm:sszzz. An example would be 2004-01-01T14:00:00+02:00 (January first, 2004, two PM with a time-zone of two hours). <interval> specifies the interval in minutes. Minimum is 5. Finally, the <userEmail> must be replaced with the SMTP email address of the user for which the free/busy information is requested. If you want to request the free/busy data for multiple persons for the same date range, you can add more &u=SMTP:<Emailaddress>. However, the maximum length for the GET command is 1024 bytes. It is important that you send that User-Agent string along. If you don't pretend to be an Internet Explorer 6 or later, you won't get an XML response because OWA thinks you are using a down-level browser which don't understands XML. 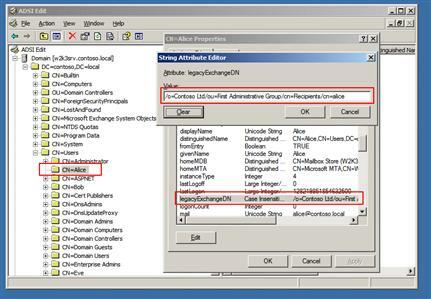 This method will also not work with Exchange 2007, as most of the OWA commands have been removed from Exchange. The Web Storage System of the Exchange system allows one to access the various properties of any item (e.g. a mail or appointment) via WebDAV. When a HTTP or WebDAV request is issued agains an Exchange 2003 or 2007 public folder or mailbox folder, the server returns a HTTP/1.1 440 Login Timeout error if Form Based authentication is enabled. The Exchange 2003 url is still there but it won't work. Replace the<destination-url> with the url of the uri where you want to do your request. The<domain\username> and the <password> fields must be replaced with the credential you want to use during your session. When the login was successful, you will receive two cookies that you must pass along with all further requests. If no cookies are returned, the logon was not successful. 8 // Initiate a new WebRequest to the given URI. 17 // Handle the error! 10 // Add the cookies to the request. According to Microsoft article Q234486, the cookie has to be set two times. Now, the result variable contains all user-accounts with the given account name. But in a multi-domain environment, several users may have the same account name. So, one must iterate through the list to determine the domain of each object. Unfortunately, that information is not stored within the user object. Another drawback is, that the above solution can only be used from a computer which is logged on to a domain within the forest. From outside the forest, this will not work. The solution in the next paragraph shows how to work around these issues. Get the directory entry for RootDse (LDAP://RootDse or GC://RootDse). From that entry, retrieve distinguished name for the configuration naming context (Property configurationNamingContext). Get the directory entry CN=<domain name>, CN=Partitions, <distinguished name of configuration naming context>. Replace the <domain name> with the domain part of the username, and the <distinguished name of configuration naming context> with the distinguished name of the configuration naming context found above. If no such directory entry exists, the given domain was invalid. From that entry, get the naming context of the domain (Property nCName). Now that you have the distinguished name of the domain where the desired user account is located, you can do a search on that domain (depending on your environment and the required information from the user object, it may or may not be a good idea to use the global catalog). To find the user object in domain specified above, do a search with this filter: (&(objectCategory=person)(objectClass=user)(sAMAccountName=<username>)) (Replace the <username> with the name of the account you are searching for). This search will either return one found directory entry, or nothing if no user with the given account name exists. 2 /// Searches the forrest for the directory entry of the given user.